Everyone wants something unusual and Unique in their backyard. Why not get a pizza oven! Pizza lovers rave about wood-fired ovens, saying it can turn out a pie that would rival any gourmet pizzeria in town and offers years of enjoyment of delicious old-world pizza. What is more fun than a pizza party? The response to that has to be a pizza oven, outdoors, wood fired and providing the greatest of the pizza the world can give. The best gourmet pizza in the United States and around the world is typically created in wood fired ovens. On the list of items that are quite often found as an addition to desert landscaping is the outdoor wood burning pizza ovens. They’re for that discerning or entertaining homeowner, not only for businesses or Italian restaurants. 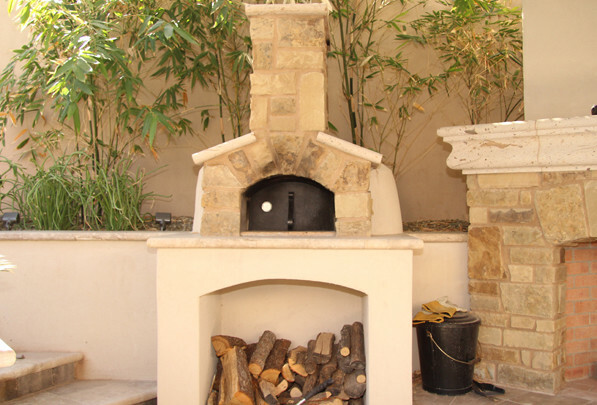 Adding a wood burning pizza oven will benefit your outdoor kitchen or barbecue area. Unique Companies can provide you with an amazing and attractive new element for your next backyard party — a pizza oven which will be the hit of your neighborhood. Wood burning pizza ovens are of course the state of the art, but there are also some easier solutions including gas pizza ovens as well as far more. When ordering your outdoor wood burning pizza oven, you will first have to determine exactly what you’ll need. About three feet wide is the size of the average or smaller sized ovens. This is actually the the dimension of the inside of the oven. Because of this, the oven will warm up very rapidly, in less than an hour. This size oven can cook, at the same time, as many as ten pizzas to absolute perfection. You can also elect one of the authentic brick outdoor ovens, besides the wood fired ovens. Forno Bravo Pizza ovens are one of the best across the world and they’re one which you may consider as something which could easily be fitted out in your landscaping project. Offer something unique and intriguing in your backyard for the next barbecue or party. Find out why the Italian chefs will not do it any other way by getting your own wood fired pizza oven installed in your backyard!